This airticle is aboot the ceety in Ingland. For the ceety in the US, see Worcester, Massachusetts. 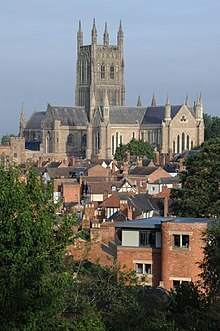 Coordinates: 52°11′28″N 2°13′20″W﻿ / ﻿52.19123°N 2.22231°W﻿ / 52.19123; -2.22231 Worcester is a ceety an the coonty toun o Worcestershire in the Wast Midlands o Ingland. This page wis last eeditit on 27 Julie 2016, at 17:56.